James Dickson. Photo by F. Mand. Our guest blogger has had a long and illustrious career studying wildlife and ecology. He spent several decades with the U.S. Forest Service as a research wildlife biologist and fifteen years as a professor at Louisiana Tech University. His accomplishments, awards and publications are numerous. Dr. Dickson is especially well known for his book: The Wild Turkey: Habitat and Management. However, as this blog illustrates, his knowledge of birds extends well beyond game birds. Other than feathers versus hair, birds are different than mammals in another obvious way – reproduction. Most mammalian females carry their young internally. Birds, to maintain light weight in an accommodation for flight, lay eggs in a nest. One of the attractions of nature are nests of birds. Birds are quite good engineers at building solid nests that usually withstand the rigors of nature’s storms. Some species even function as nature’s first litter patrol. I have seen the following in nests: pieces of paper, aluminum foil, cigarette butts, and string. String is helpful for binding material together. Now is prime nesting time for many species. 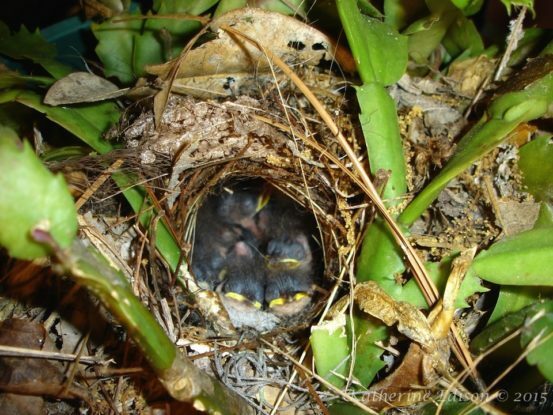 Here are some examples of some obvious nests. If you find one, don’t keep checking it closely as predators may key on your visits. 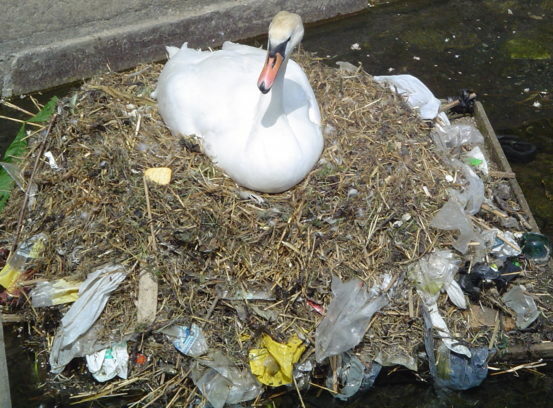 This swan nest is full of litter. 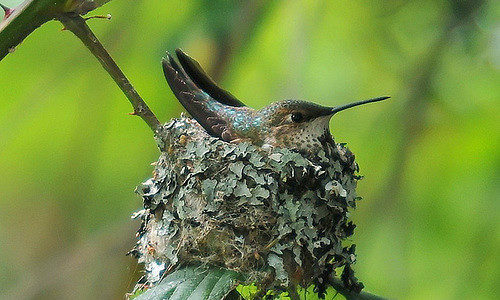 Hummingbirds build the smallest nest, like the one in the photo by Brendon Lally at the beginning of this post. The top of a tree branch will do. Lichens are used in construction. Two species that nest in shrubs, often around houses and farms, are the Northern Cardinal and Northern Mockingbird. The mockingbird nest looks loosely knit on the outside with a tighter knit inner lining. Mockingbirds guard their nest site against other birds and pesky cats. Carolina Wrens seem to have adapted well with their nesting sites to people and their dwellings. I frequently see wren nests in human-related structures such as flower pots, abandoned tires, and abandoned mail boxes. When I lived in Texas I had a closed garage with the doorknob missing from the door. Wrens would nest in the garage each year. They would fly unerringly through the small doorknob hole – kind of like a wood duck flying into her nest cavity. I don’t know how they didn’t injure themselves. I think the garage door also made a nice large predator guard for the wren nest inside. Now a pair of wrens nest in my garage every year, on top of my decoy bag. Mourning doves have a loosely constructed nest. Eggs sometimes can be seen from beneath. I don’t see how dove nests survive wind storms. My friend Dorie saw many nests and even stunned adult doves on the ground after a hailstorm in Texas. Most species of ducks and large game birds, such as wild turkeys and quail, nest on the ground. Northern Bobwhites construct a little nest with a dome cover. The male helps with the nesting duties. When Wild Turkey hens lay and then turn their eggs, it flattens out a little nest. Mothers are on their own. Males play no role in nesting or poult rearing. 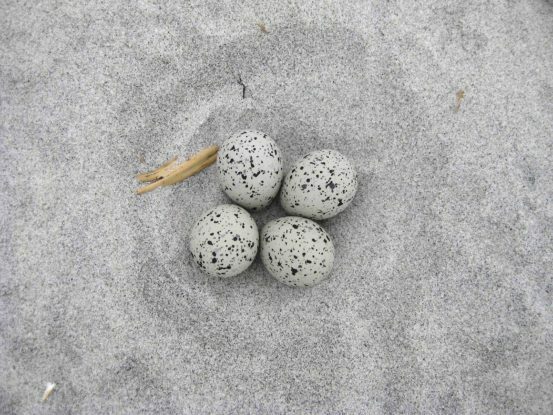 Killdeer are a type of shorebird – a plover – and nest on open sandy/gravelly surfaces and have cryptic, camouflaged eggs. Sometimes you can find a nest in a parking lot or along a gravel road. Attentive mothers lead predators away with their wounded wing ploy. I have seen chicks on gravel roofs, but don’t know how they get down to feed before they are able to fly. The Killdeer’s cousin, the Piping Plover, hardly makes a nest at all. It scrapes a shallow depression in the sand above the high tide line and deposits its eggs there. Occasionally, the nest is decorated with a few smalls shells. Like the Killdeer, the eggs and the young are well camouflaged. Some species, such as Tufted Titmouse, Yellow-billed Cuckoo, and Red-eyed Vireo nest in tree canopies. So, not climbing trees, I don’t find them. But the White-eyed Vireo nests at shrub height and I find a few of them. Vireo nests are pendulous, usually hanging down from forked branches. Some large species construct large bulky nests, often using nests repeatedly year after year. 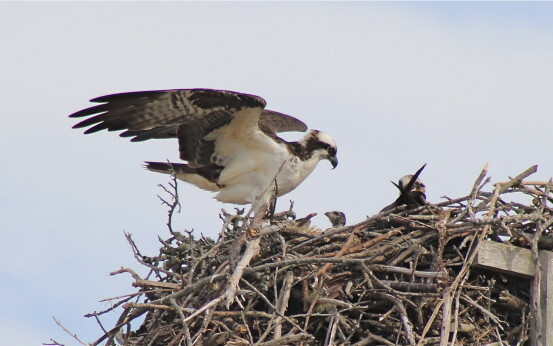 Red-tailed Hawks, Osprey, and Bald Eagles all construct large bulky nests. To get a great look at an Osprey nest and its inhabitants through a spotting scope, head on down to Nelson Park in Plymouth every Friday from 10 AM to 1 PM where you will find the Beach Ambassadors, Goldenrod’s volunteer corps. Woodpeckers excavate wood in trees for cavity nests. Other species use abandoned woodpecker nests and other cavity structure for their nests. I’ll treat these in another article. S0 – enjoy what nature has to offer! There’s a lot to take in without an app.